Contact Us https://damclassicracing.com.au/contact-us/ if you want to look at the non-standard kit options. Gijs van Dijk has swapped the silent blocs to needle bearings on my 500's. Thanks for you reply I've emailed you. Brilliant thanks as I am about to paint the frame so it's a good time to do this. Sorry, but that is very, very wrong, and potentially quite dangerous. The spindle and the centre bearing races with distance tube should be done up TIGHT between the frame gussets. The assembly needs to be a SNUG FIT between the gussets to begin off with. Needle races are non-adjustable, once they're knackered, they require replacing. 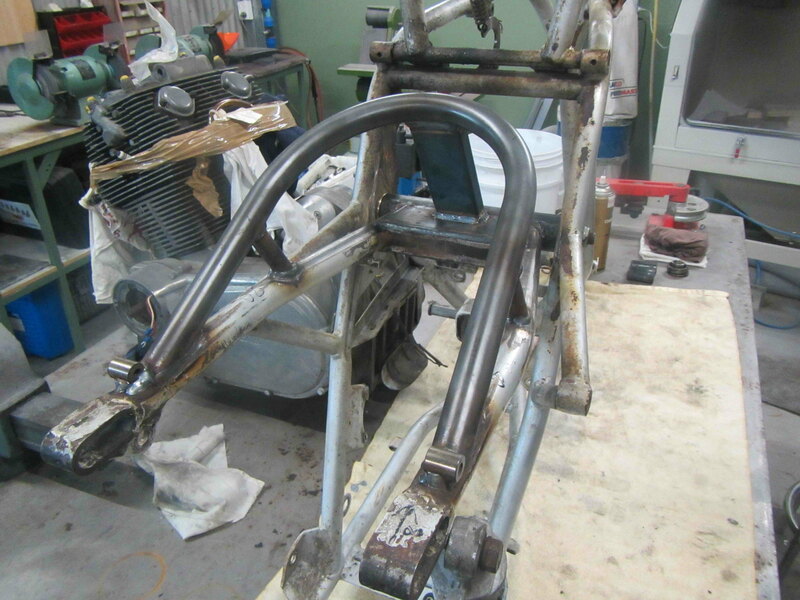 The swingarm should pivot around the central bearing race/tube assembly, thrust washers taking up side play of the swingarm pivot tube between the frame gussets. What you're doing, is letting the entire swingarm assembly pivot around the spindle and stressing the frame by "tweaking the spindle nuts", with danger of the spindle locating holes in the frame wearing because the spindle isn't tight. 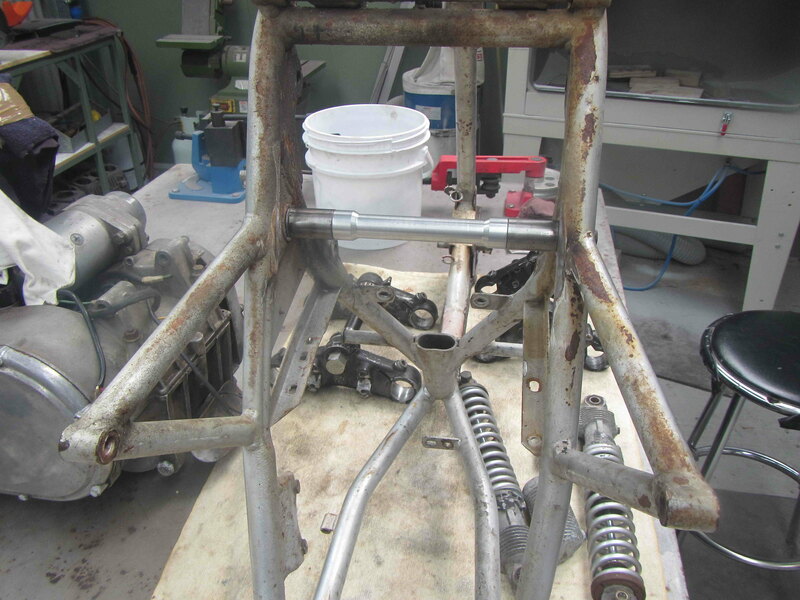 By tweaking the spindle nuts, you're simply further binding the swingarm between the frame gussets. You are also inducing shear loads on the spindle, something it isn't designed for. I recommend you have a good think about this and compare your set up with that of the triples. The 'thrust washers' were supplied from Laverda made from Nylon on the later models. Part no. 33116499. It is still good practice to make these out of Bronze for racing as we did on our bikes also but nylon is sufficient and is standard replacement in the swingarm kits. You are also inducing shear loads on the spindle, something it isn't designed for. Sorry Piet, while you're correct in your critique of Fitz's drawing, that comment about shear load doesn't make sense to me. The swingarm spindle is under axial tension when you do up the nuts, but the working loads are pretty much all shear, so that's exactly what it's designed for. There are no bending loads, and you'd only get torsional loads if a bearing seizes. When everything is tightly clamped down, the spindle will be in tension and the clamping force between the frame and tube assembly will/should eliminate shearing forces at the spindle to a great degree, if not totally. Once the spindle is loose, as in Fitzs' example, it will be fully open to bend and shear forces, as these will all be transmitted straight into the spindle. Another example of this type of fixing is the cam joint in the 750 twins. The cam halves are held together with 3 x 6mm studs through the timing sprocket, drive is tranmitted through friction/clamping forces attained by tightening the studs. Once these studs loosen just a tiny bit, the whole plot simply dissolves, as the studs don't stand a chance against the shear forces. OK. I can see your reasoning that some of the shear load across the frame-swingarm joint is carried by friction between the end of the inner bearing race and the frame plate. But I reckon the major proportion of the load would be carried by the shaft itself. The nuts on the ends of the swingarm spindle are there mainly to hold it in place. I can't claim to know the relative distribution of loads for sure, maybe friction does most of it, or maybe not. But I'd be very confident in saying that the designers would have sized the shaft to carry the all the suspension loads on its own, assuming zero contribution from friction between components. It would be too risky to do otherwise because they'd want the bike to be bulletproof safe if the nuts weren't done up to the correct tension. Some contemporary bikes that have a similar sized swingarm pivot shaft (my Ducati for instance) don't have nuts on the ends of the shaft at all. It's just held in position by a pinch bolt at each side of the frame (photo below). There's no compressive load on the bearing/spacer stack, and therefore no possibility of shear load being carried by friction between the components. All the shear load is carried by the shaft. End float is controlled by shims if necessary. There's not much wrong with Ducati frames. They're renowned for good handling. There's not much wrong with Ducati frames. The use of an M8 rear engine mount bolt should is questionable though. Please compare the size of the Ducati axle with the Laverda spindle, apples and pears, completely different loadings. The Duc axle takes up shear loads, the same as the Laverda AXLE or bearing/tube assembly.